One of our clients is selling her Kawai baby grand piano, a GM-12. 5 feet long and almost new (only 6 years), this piano has been tuned, maintained and adjusted by us since a few years. Thanks to its well-balanced sound and precise mechanism, this instrument is in good conditon. Price: $7 500. Our technician recently made an interesting discovery in a client’s piano bench. He found the maintenance manual provided by Yamaha to buyers of a new acoustic piano. Knowing the reputation of Yamaha pianos, we were keen to read it. The manufacturer mentions the need for at least one tuning per year (and even two) and for precise adjustments performed by an expert technician. Such work ensures that the piano continues to perform at its best. The booklet also contains a wealth of information about the best location in a room for a piano (right acoustics, the need for ventilation, the required distance from windows and the heating system), and consistent temperature and humidity levels (avoid excessive dryness and humidity). Would you like to know how to clean your piano’s keyboard? The manufacturer provides clear instructions. It also recommends not placing anything on the instrument (aside from music scores and a metronome, of course!). Finally, Yamaha reminds us how an accumulation of dust can be harmful to the hammers and action. So if your piano brings joy to you and your family, and you would like to keep it in good condition for a long time, then this document is for you! At PIANO TECHNIQUE MONTREAL, our ultimate goal is to improve your piano’s condition to increase your joy of playing. Our courteous approach and high level of expertise allow us to satisfy the most demanding customers who require the best possible service. Whether your instrument needs tuning, repair or adjustment, you can count on our care and attention to detail, which we invest with professionalism in every aspect of our work. We’re also happy to put our knowledge, expertise and skills at your service if you’re regarding the acquisition, disposal or evaluation of a piano. Piano Technique Montréal will consider your needs and constraints to help you make the best possible choice. Schedule an appointment online OR call us at 514 344-8008. Maintenance for your new piano…nonsense? You’ve recently fulfilled a long-held dream and bought your brand-new piano. Congratulations! Of course, with a considerable investment such as this, you want your cherished instrument to remain in its perfect condition as long as possible. 1- Most piano manufacturers recommend two tunings per year. This recommendation is made not only by piano technicians, but by the piano manufacturers themselves, like Yamaha and Steinway. This ensures the instrument’s stability and increases its longevity. Therefore, when you buy a new piano, make sure your retailer’s after-sales services include at least one free tuning during the initial year of use. 2- Your new piano will need a running-in maintenance after some time. One should remember that a piano is made of wood, a living material that keeps on “working” for some years. It is not unusual to see some hammer shanks slightly twist over time, and consequently, these hammers won’t perfectly hit the three strings any more. If not repaired early, this small misalignment may eventually cause bigger damage to the hammers, becoming more difficult and costly to fix. 3- Your new piano will be as sensitive to fluctuating humidity levels as older pianos. Whatever its age or condition, no music instrument made largely of wood will resist to the detrimental effects caused by fluctuating humidity levels, from very dry during our cold winters to highly humid during hot summers. Every trustworthy piano retailer will warn you about this! Cracked soundboard in an almost new piano. Source : PTM. Nevertheless, some retailers will not insist on installing a humidity control system in your piano since this represents an additional expense that you didn’t plan for. But it is never too late to do the right thing! Once your beloved piano benefits from a microclimate with a constant level of humidity from season to season, you’ve already helped to extend its life and protect your investment. Piano tuning or pitch raise/lowering? What differentiates piano tuning and pitch raise/lowering? According to WordReference.com, tuning is defined by “to adjust [a musical instrument] to a correct or given standard of pitch” but also “the state of being in harmony” [with other instruments]. Of course, this also applies to piano tuning! Piano tuners must adjust pitch -or intonation- with a tuning hammer by manipulating tuning pins following a specific procedure that both allows the most stable tuning as possible and preserves the instrument’s integrity. They must do so by dividing the octave into 12 equal semitones while taking into account the piano’s inharmonicity. For this purpose, piano tuners regularly use softwares applications like Tunelab and Verituner. Also, some performers – mostly for early music – will at times require an unequal division of the 12 semitones. This is called unequal temperament and will be the topic in an upcoming article. Above all, what’s the most important for a perfect tuning is the purity of unisons and octaves. Approximately two-thirds of the piano keys are related to three strings that should be tuned in unison. If you play a single note on the piano and hear some quick wave effects, this means the unison is out of tune. If you wait until the piano sounds dissonant before asking for a piano maintenance, your technician might have to pitch raise or lower the instrument prior to doing an actual tuning. Such a significant adjustment will be avoided by tuning the piano twice a year, allowing a more rigorous maintenance of the instrument and its condition by the technician. Pitch naturally oscillates as humidity level varies. During summer, the soundboard will swell until it affects the strings angle on the bridge and consequently, pitch goes up. During winter, pitch goes down as the soundboard shrinks and lowers the tension of the strings. Pianos are designed and calibrated to sustain their middle A at 440 Hz. With this standard pitch, pianos can be played in harmony with other instruments. This explains why a piano should be kept as close as possible to the correct pitch. When the piano moves too far away from it, such as a quarter tone or more, your technician will have to work harder to bring back your piano on pitch and will probably charge you additional fees. Moreover, as your piano moves further from pitch before every tuning, its tuning stability will be increasingly reduced. Your piano was a considerable investment and you are probably aware how much the humidity level fluctuations will damage and shorten its longevity! So, when your piano tuner recommends the addition of a Dampp Chaser system (also called Piano Life Saver) for your piano, the following facts will help you to make an informed decision. Henceforth, no doubts about the Dampp Chaser system’s effectiveness remain. It has been approved over the years by piano manufacturers and virtually all piano tuners. Piano owners are also unanimous about this: since its installation, tuning is more stable and the piano sounds and plays better. The other good news is that their piano will last twice as long! Why does the installation of the Dampp Chaser system require a professional piano technician? The Dampp Chaser Corporation provides training and certification to help piano technicians evaluate the system’s relevance according to any given environment. Therefore, the company will not sell its products directly to the consumers who would prefer to install the device by themselves. This policy ensures that systems are properly installed based on the piano conditions, its location and specific requirements. For these reasons, a professional installation is required for the five-year warranty coverage. Of course, the ideal environment for a musical instrument would be a museum, with its perfectly controlled atmosphere! If your house is fitted with such a climatic control system, you actually don’t need a Piano Life Saver device. In fact, how many homeowners keep the air conditioning system working rigorously all summer long? Few places on Earth naturally offer favourable conditions for pianos. Close to the sea, salty air and humidity cause much damage to wood-based instruments. Have you ever seen one of these pianos in Cuban hotels? On the other hand, the need for heating our homes during winter-time, due to the alternation of seasons under our Nordic climate, is as much problematic to piano care and maintenance. Invisible for upright pianos, barely visible underneath the soundboard for grand pianos, the system is completely silent for all types of instruments. It has a panel with LED lights indicating that it has electrical power and blinking when a water refill is needed (about once a week during winter, less often during summer). The exact amount of water and Pad Treatment is poured into the tank with an Universal Watering can (custom-made by Dampp-Chaser) by inserting the nozzle into the end of the watering tube. One capful of Pad Treatment added to the water inhibits the growth of moulds and excessive scale buildups. But in any case, the system must remain constantly plugged into an electrical outlet unconnected to a light switch (although an occasional power interruption, for a few hours or days may not cause catastrophic effects). Once a year, your technician will dismount the whole system for a thorough cleaning and inspection (cost: $45 if done along with a piano tuning). Twice a year (according to the manufacturer’s recommendation), your piano technician must replace the humidifier pads and plastic sleeves, and, if needed, provide a replacement bottle of Pad Treatment. The Dampp Chaser Corporation describes how its system outperforms and costs much less in electricity and trouble than any other humidifier/dehumidifier system for piano care and maintenance. Just think about the routine of filling or emptying gallons of water daily with home or portable systems, while a Dampp Chaser needs a quick refill weekly or every two weeks! A tailor-made wool string cover will help create a microclimate for your piano’s soundboard and pinblock, without any contact on the strings and effect on the sound. A less expensive alternative would be to spread a blanket over the piano between uses. For your piano, how about a pretty custom-made cover like this one? A Dampp Chaser underneath the piano and a string cover above it: both will envelop your instrument inside a protective cocoon and prevent it from damage and unstable tuning. Even if we like maintaining your piano, we’re happy for you when it stays in tune longer! Is your piano making some clicking noises? Don’t worry, there are solutions! RED: the screws holding the hammer assembly and the whippen may be loose. This simply requires tightening. GREEN: lead weights inserted into the keys and the damper assembly can be noisy if they are not firmly held. We must crush them a bit more so their expansion eliminates vibration. BLUE: pivots can be the source of many of those clicks. We must replace the felt bushings or replace the pin with a larger one. YELLOW: the hammer head itself can loosen. Also, the roller (9) might be unglued, the keys themselves may touch one another, or on an upright piano, the bridle strap may touch a neighbouring catcher’s rod, etc. Tightening a few screws and gluing a few hammer heads may be included in a regular appointment, but other issues may take longer to fix … Call us! A piano, even a small upright, is awfully heavy, but putting it on its back is sometimes necessary. Need to install new rubber casters to replace the old metal ones that are seized and would ruin the floor ? With the right tool, one man can manage easily. 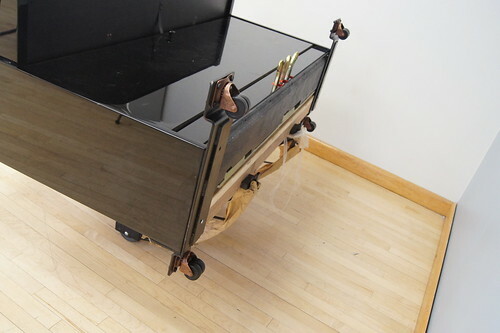 In this case, the goal was to install a permanent dolly so the piano could be moved around the room. Today is the launching of the English section of my web site. I am having three pages professionally translated (“services”, “a few tips” and “about us”) and this should be online before the weekend is online now. For the articles, I am not too sure. Writing in French, my mother-tongue, is hard enough; would it be wise to translate or write the articles in English myself ? I suppose some reader would graciously advise me of wrong wordings or weird phrasing, even offer a better way to say. Let’s make it an invitation… and welcome !